Similar to the cycles tool, however instead of counting bars between two points, the change in aspect between two planets is measured, and repeated. To apply the Synodic Cycles tool to your chart, select the Tools menu located at the top of the Optuma screen. From the Astro tools, select Synodic Cycles. Left-click on the chart at your starting point, then left-click a second time at the desired chart position. Optuma will then draw the Synodic Cycle using the default settings. 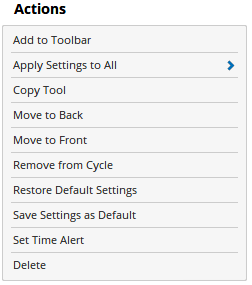 Add to Toolbar: Click this action to add the selected Synodic Cycle to your custom toolbar. Apply Settings to All: When multiple Synodic Cycles have been applied to a chart, page or workbook, this action can be used to apply the settings of the one selected to other instances of the tool. This is a great time saver if an adjustment is made to the tool - such as hiding or adding levels - as this allows all the other Synodic Cycles in the chart, page or entire workbook to be updated instantly. Copy Tool: Allows you to copy the selected Synodic Cycle, which can then be pasted onto a different chart window. Remove from Cycle: When the Synodic cycle is setup with multiple cycles in the order, this action allows you to remove one of those cycles from the sequence. Restore Default Settings: Click this action if you have adjusted the default settings of the Synodic Cycle, and wish to return to the standard properties originally installed with Optuma. Save Settings as Default: If you have adjusted any of the Properties (colour, for example) you can save the adjustments as your new default setting. Each time the Synodic Cycle is applied to a chart, the tool will display using the new settings. Set Time Alert: Will set a time alert for the selected Synodic cycle line. For more information on Time Alerts, click here. Delete: Delete the Synodic Cycle from the chart. Planet 1: Choose the first planet to be displayed. Planet 2: Choose the second planet to be displayed. Geo / Helio / Sidereal: Allows you to choose the Synodic Cycles setting between geocentric, heliocentric, and sidereal. GMT Offset: Use this option to adjust the Synodic Cycles time zone setting for a specific market. Select the required GMT setting and the ephemeris will automatically update. Show Vertical Lines: When deselected the vertical lines will not be displayed. Line Over All Views: When selected the Synodic lines will extend across the complete chart and any view tools, e.g volume. Show Dates: When selected the date label for each Synodic line will be displayed. Font Size: Allows you to adjust the size of the text displayed in the label. Moving the slider bar to the right increases the font size. Lock to Round Numbers: As it is possible to vary the cycle length by simply dragging one of the cycle lines, the result can be a cycle size that includes a decimal value, e.g. 24.18 degrees. 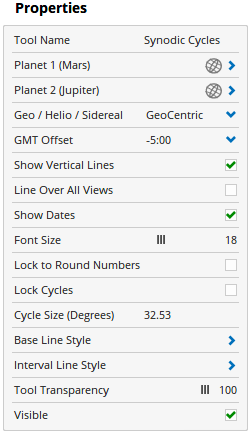 When the Lock to Round Numbers option is selected this will ensure that the Cycle Size is displayed in whole numbers only. 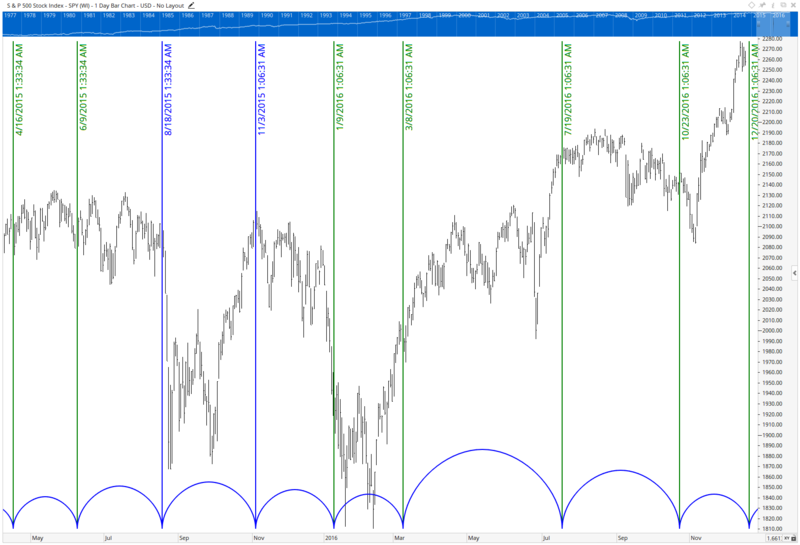 Lock Cycles: If you have other tools on your chart that you wish to move or adjust then there is a chance that you may inadvertently adjust the Cycle size. Selecting Lock Cycles will prevent any accidental cycle size adjustment when you are working with other tools on your chart. Cycle Size (Degrees): This value represents the number of degrees per cycle. Line Width: Allows you to adjust the width of the Base Line. Moving the slider bar to the right will increase the thickness of the line. Line Colour: Allows you to select the colour of the Base Line. Clicking on the drop-down arrow will display a colour swatch. Locate the desired colour and left-click it once to select it. Transparency: Use this slider bar to adjust the transparency of the Base Line. Moving the slider to the left will increase the transparency of the tool. Interval Line Style: This option expands to display the same properties as the Base Line Style less the Transparency property.